This machine replaced the A4000/A5000 series and was a lower-cost alternative to the RISC PC. 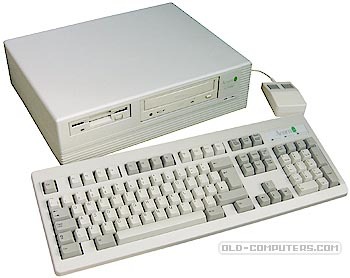 The styling was similar, featuring a very strong but lightweight ABS case with the floppy and CD drive in different places and without the clever stackable case design. Acorn made the A7000 a very neat system, reducing cost by using far fewer components on the motherboard. 4MB is built into the mainboard with a single 72-pin slot for standard off-the-shelf PC RAM. Gone is the non-standard Acorn 3-button mouse used since the first Archimedes model, which was expensive and difficult to find if broken or lost, instead a standard PS2 unit is supplied. The only slightly annoying quirk is that you can�t use the optional expansion slot backplane and optional CD drive at the same time as they occupy the same physical area of the small case. One surprise with this machine is the connector on the motherboard marked "Genlock", designed for video editing/combining/overlaying hardware, such as the Millipede AlphaLock Studio. One person has even found a way to wire an Acorn A4 LCD into it. Like the RISC PC, it was usually supplied with a Microvitec multisync SVGA monitor (sometimes with an Acorn badge) which allowed for all the slightly weird screen resolutions that Acorns were capable of, which some PC monitors didn�t like. When the British supermarket Tesco launched its successful �computers for schools� charity fundraising scheme, it had the A7000 proudly displayed on its campaign posters. Unfortunately due to the increasing march of PC clones into schools this turned out to be the last all-new design Acorn computer released apart from the Phoebe/RISC PC II computer which was never released. A improved A7000+ was released around 96/97. There was double the amount of onboard DRAM (now 8MB), and a 1.2GB Seagate hard drive. Motherboard was only Archimedes range computer to also have a 72pin SIMM (EDO) RAM slot to take standard PC memory at that time. It could take up to a 128MB SIMM, as well as it's own on board 4MB memory giving it a limit of 132MB RAM. There is also a network slot on the motherboard to allow you to purchase a network interface card. There are Econet and Ethernet cards available for this slot and, unlike previous versions of RISC OS, TCP/IP is built into the OS ROMs that come with the A7000. COLORS 4 greys or 16 greys or 16 colours or 256 greys or 256 colours or 32K colours or 16M colours. The cursor always retains the same blue colour no matter what mode is used. see more Acorn Computer Archimedes A7000 Ebay auctions !